Monthly rentals are welcome and start at $3500/mo but vary by season, please inquire for details. You won’t believe the incredible location of this historic Bayfront Morro Bay Cottage, built in the early 1900’s and situated on over a quarter of an acre in one of the best locations in the area. This beautiful quaint cottage is the perfect location for your peaceful Morro Bay retreat with friends and family. The cottage has a nice layout with a living space that opens to the dining area, with great views of the bay. The back yard is the gem of this property, very large with sweeping views of the bay from Morro Rock to Montana de Oro, looking out over the bay and harbor. •	The front bedroom features a queen bed and has a TV. •	The back bedroom has a California King sized bed. •	Living room features flat screen TV with DVD player and fireplace. •	The back yard has a nice patio and seating area to enjoy the scenery. •	BBQ in the back yard to enjoy outdoor meals. •	Full size washer and dryer for guest use. •	The garage can accommodate 2 vehicles and additional parking is available in the driveway. This home can accept 2 small dogs (under 20lbs) or 1 medium dog (60lbs max) and must abide by our pet policy. Urelax Vacation Rentals is THE SOURCE for professionally managed Vacation Rentals located in Morro Bay, Cayucos, Los Osos, and Paso Robles. We are available 7 days / 24 hours a day to deal with any emergency or issue that might arise during your stay. We recommend that you review all our homes to find the perfect fit for your group. Every home we have in our inventory can be viewed on VRBO and other Homeaway sites. Stay with us once and you will discover the many ways we are different and the best choice for your vacation. Great stay, comfy beds, and great views. 4 instead of 5 stars-- the house and location are magical but it is dated and probably not appropriate for small children, active dogs or anyone who is disabled. Deck down at waterfront, above the bay, mesmerizing and tranquil but a straight drop off so I was glad I didn't have my dog in residence. Electric in kitchen a bit challenged, circuit blown with Keurig and toaster plugged in. Old fashioned furnishings add to its comfort and charm. It feels spacious. Walking distance to State Park or down to Embarcadero. A wonderful back porch and great view from dining room. I'd stay there again but would suggest a few upgrades. Tub/shower could use grab bar and modern faucet to better regulate hot/cold. Shower though had terrific pressure. When I called about circuit going out, manager checked back within hours. It is Granny's house with a view! Home is old, clean with a great view and all you need. PET friendly! Could use some updating for sure! Is as presented in pictures. Close to wine country and beaches. 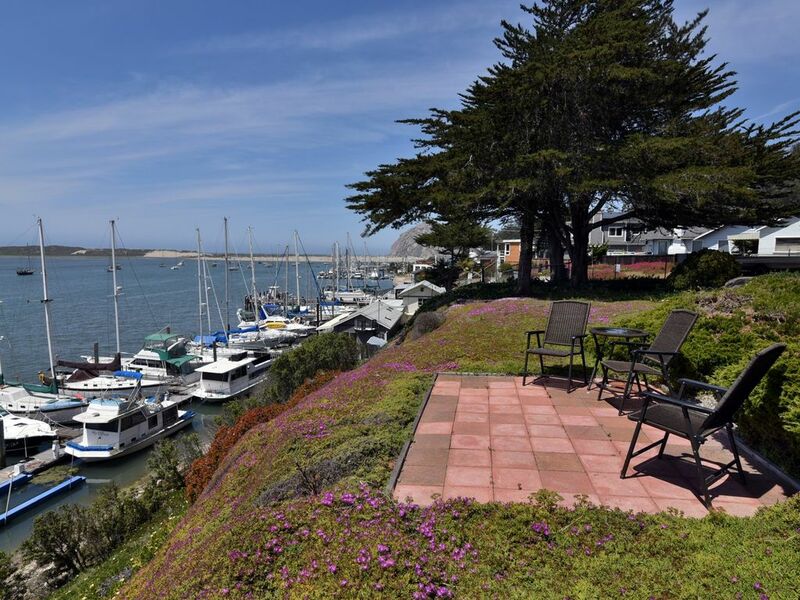 This charming home overlooking the Morro Bay Harbor is in a wonderful location, just .7 miles to downtown Morro Bay. A short walking path takes you to a bird sanctuary home to over 250 species of birds. A short walk to the golf course takes you up to a spectacular hiking trail with a panoramic view of the rolling hills. We loved the home, which is like an old-fashioned lake cabin. The Morro Bay area offers many outdoor activities such as kayaking, deep-sea fishing, whale-watching, surfing, amazing hiking and biking trails. Morro Bay offers lots of eclectic boutique shops and is a great location for antique shopping! The biggest attraction in the area is Hearst Castle which is about 25 miles north along beautiful Highway 1. Along the way be sure to stop to see the famous elephant seals that spend the winter here. If you drive beyond Hearst Castle you enter the amazing Big Sur coast. Because San Luis Obispo is the home of California Polytechnical Institute, there are many great cultural events available and lots of entertainment and shopping. Be sure to take in the famous Thursday night Farmer's Market in downtown SLO.